From adapting to our changing climate and creating jobs for young people to the rise of Arab women and the region's most exciting start-ups, here's a look at some of the key moments from our MENA summit at the Dead Sea in Jordan. One of the biggest challenges facing the Arab world is how to create enough jobs for its burgeoning youth population. According to the International Monetary Fund, about five million workers enter the Middle Eastern job market every year, and the percentage of the population under the age of 25 ranges from 25% in Qatar to 50% in Oman. H.M. King Abdullah Il bin Al Hussein of Jordan alluded to this in his speech in our opening session on day one. "Our most important strength is Jordan's high-skilled human capital," he said. "Our young people are globally connected, tech-savvy, fluent in multiple languages and are determined to succeed. They are proven assets to every enterprise." The region needs politicians and business leaders to create the right environment for people to flourish, King Abdullah II went on to say. "Our people need you ... to act. And the entire world needs you to succeed." The need to avoid catastrophic climate change was one of the key themes of the meeting, dominating discussions throughout the weekend. 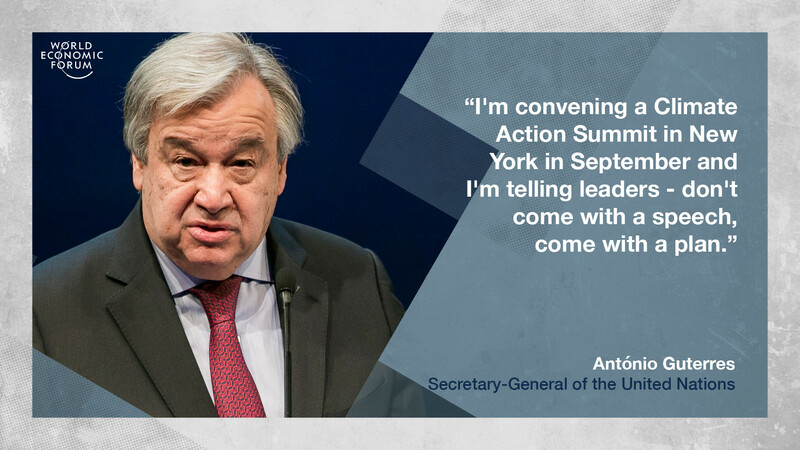 UN Secretary-General António Guterres spoke on day one, and he had a strong message for world leaders planning to attend the Climate Action Summit in September. "It is high time for urgency and more ambition," he said. "This is why I am convening an Climate Action Summit in New York in September, and I am telling leaders, don't come with a speech - come with a plan!" The Secretary-General also sat down for an interview with us, during which he spoke about the ongoing refugee crisis, and what lessons the West can learn from the Arab world on how to look after the world's displaced people. "The Arab world has opened its doors to refugees, and unfortunately many developed countries are closing theirs ... We need more generosity," he said. Before the meeting kicked off, we released a report looking at the key risks facing the region. The Middle East and North Africa Risks Landscape looks in-depth at risks such as climate change, energy price shocks, water scarcity, conflict and other challenges countries in the region will have to work to overcome in the coming years. For a summation of what is in this report, take a look at this article by our Forum colleague Ariel Kastner. In 2018, $900 million was invested across the region in 386 deals, an increase of 31% in total funding in 2017. To highlight this, earlier this week we released a list of the 100 most exciting start-ups in the Arab world. This article takes a closer look at 10 of the start-ups that are helping to solve several of the region's most pressing challenges, from camel milk antibodies to the region's first unicorn. And to see the full list, launched in partnership with the Bahrain Economic Development Board (EDB), click here. Less than a quarter of women in MENA are employed and, according to the ILO, the region has the lowest global representation for women in management and leadership positions. Though progress has been slow, this could be about to change as governments and business leaders wake up to the huge opportunity that bringing more women into the workforce would bring to the region. In the session The Rise of Arab Women, Saudi Arabia’s first female lawyer Sofana Rabea Dahlan described how it took 13 years for her to get qualified due to gender discrimination. But she says through persistence and patience she obtained her licence. “It taught me that we have to have patience in our people, in our systems, we have to have be able to open the dialogue, no matter how long it takes,” she said. Meanwhile, Sahar Nasr, Egypt's Minister of International Cooperation said that it is important for government ministers, such as herself, to keep striving to amend laws that undermine women. "These are the things that we review as policy-makers, and this is where Parliament lays an active role and there has to be an article where people just get access," she said. The so-called Islamic State has suffered significant losses, but the jihadist group remains a threat, according to panelists in the session Radicalization - Lessons from the Past, on day two of the meeting. "You can kill a person, take a territory, but getting an idea is a whole other matter, and the idea still lives," said Anne Speckhard, Director of the International Center for the Study of Violent Extremism. "ISIS was selling a dream of an Islamic caliphate with purpose and dignity, and that dream still lives," she added. Education will play a major role in stopping more young men and women becoming radicalized, said Latifa Ibn Ziaten, founder of the Imad Association for Youth and Peace. Her own son, a French soldier, was killed by a terrorist in Toulouse. "Education is the first step, but children need to be supported in every walk of their lives ... We must listen to our young people. We must support our young people, whoever they are. They need support." "There is still a lot of hatred online," she went on to say. "When you insult somebody online, on social media, it goes worldwide. But when you send a letter, you can tear the piece of paper and put it in the garbage can. Men have set up this machinery and it must be better controlled. "I paid the highest possible price. I lost a son of 30. Without the machinery, my son would be here." Like all other regions around the world, the Middle East and North Africa is being transformed by the advance of the Fourth Industrial Revolution. Is the region prepared, and how can it make sure no-one is left behind? The UAE is well poised for the new industrial revolution, said Omar bin Sultan Al Olama, the country's minister for AI. "We're developing incentives for AI companies, developing incentives for data centres to move to the UAE and we understand 100% that the new industrial revolution is focused on quality data and computers." The Bahrain Economic Development Board's Khalid Al Rumaihi said that it is essential that the region stays at the vanguard of the new era of industrialization. "I think it would be detrimental to the Middle East if we ignore what technology has to offer," he said. "Not just for the technology and its sake but the jobs." He added, "Ultimately all of us in the Middle East need to create jobs and these jobs are going to come in the future as engineer, coder, data scientists."